Readers of Jennifer Crusie, Rainbow Rowell and Graeme Simsion will likely enjoy Crosstalk, the latest romantic novel from the queen of humorous and entertaining Science Fiction, Connie Willis. Briddie Flannigan works for a mobile phone company working on a big new release to rival Apple’s latest offering. Simultaneously, her boyfriend Trent pops a very millennial question, asking her to join him in undertaking a neurological procedure that will bring them closer by allowing them to directly feel one another’s emotions. When things go slightly awry with the procedure, Briddie must reevaluate many aspects of both her life and modern life in general, guided by an unlikely support team: scruffy and quirky anti hero C.B. Schwartz, a colleague of hers at the mobile phone company; and her precocious 9-year old niece Maeve. One thing that has always simultaneously delighted and perplexed me about Connie Willis is her ability to have her finger on the social pulse, while often discounting or neglecting crucial technological developments. The absence of a portable phone system in Willis’s 2050 Oxford in Doomsday Book and To Say Nothing of the Dog is infuriating at times, but I also recognise that the grim chaos and confusion of Doomsday Book, and the extreme farce of To Say Nothing of the Dog couldn’t have happened without the plot device that the lack of mobile telephony enables. Willis makes up for this technological oversight in Crosstalk by embracing the mobile phone trope, and ramping up connectivity to an unbearable level. I don’t want to provide too many spoilers, but it is very fair to say that this is definitely a novel about connection fatigue. And in the modern world, what better connection is there than love? I have always adored Willis’s romantic subplots, as she has intelligent, self-possessed heroines and a gorgeous line of attractive anti-heroes. Her romantic heroes are never alpha males, are often slightly bumbling and scruffy or socially inept, but reveal themselves to be sensitive, intelligent and have the kind of hidden depths and social intelligence you only encounter upon getting to know someone a little better. Crosstalk explores not only connection fatigue, but also romance fatigue in general. In many ways, this is a romance novel for readers who are sick of or suspicious of romance. It is a truth (almost) universally acknowledged, that there are myriad ways to find love in the 21st century. Mrs Bennett may still take some convincing, but over the course of Curtis Sittenfeld’s Eligible, the modern Bennett girls of Cincinnati discover that love and happiness come in many forms. There have been several modern reboots of Pride and Prejudice in the last decade, notably Bridget Jones, Bride and Prejudice and The Lizzie Bennet Diaries, and I have found each enjoyable for it’s creator’s reshaping of a classic story. For the reader, there is a certain glee in knowing the ins and outs of the story, but not the particulars. I always appreciate the slow reveal as everything comes together and the particulars in Eligible are particularly well done. Enter Longbourn as a neglected, cluttered mock-tudor mansion on one of Cincinnati’s best streets. Elizabeth is a 38 year old journalist and Jane a 40 year old yoga instructor, both home from a decade in New York to help out with the family after Mr Bennett has a health scare. Mr Collins is a start-up millionaire. Kitty and Lydia are obsessed with Cross Fit and Paleo diets. Mary is completing her third online masters degree and Mrs Bennet has a shopping addiction. Bingley and Darcy are, of course, both doctors. 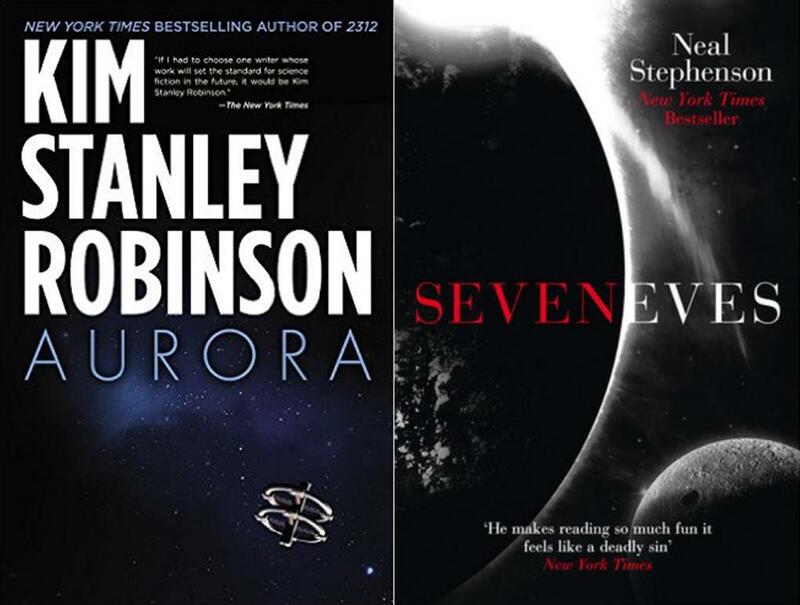 It’s been an exciting year for science fiction, with two of the genre’s largest names publishing very 21st century novels about intergenerational space journeys. Neal Stephenson’s new novel Seveneves is typically Stephenson-esque, with fast pacing, adventure, lots of geeky science detail, and a nice little ongoing dialogue about the philosophical and practical merits of science vs politics. When an unexplained event breaks the moon into multiple pieces, Earth’s population must rapidly plan and execute an evacuation strategy to avoid the 10,000 year meteor shower that will soon render the surface of Earth uninhabitable. A rapid hack of the International Space Station, followed by a mad cap space race to secure the resources required for continued human existence in space takes up the first half of the book. The second half of the book speculates on what remaining human life may look like 5,000 years in the future. Among Others was recommended by a friend of a friend, and when I finally got round to reading it it turned out to be one of those books that I felt had been grown in a lab, just for me. It’s a love letter to reading, set in rural England and Wales in the 1970’s, with just enough fantasy beneath the surface to intrigue me, without needing me to suspend disbelief.